The new BF 300 C-2 track paver on display in BOMAG booth #17115 during World of Asphalt 2019 in Indianapolis, Ind. February 12-14 offers hydraulically variable paving widths from 5.6 ft (1.7 m) to 11.2 ft (3.4 m). The new BF 300 C-2 track paver on display in BOMAG booth #17115 during World of Asphalt 2019 in Indianapolis, Ind. February 12-14 offers hydraulically variable paving widths from 5.6 ft (1.7 m) to 11.2 ft (3.4 m). BOMAG screed extensions, available in 13.8- and 19.7-in (35- and 50-cm) widths, feature Quick Coupling technology that utilizes a wedge-and-socket design with locking handle to quickly extend maximum paving widths to 16.4 ft (5 m). Available reduction skids allow for 2.3-ft (0.71-m) paving widths, significantly increasing the paver's flexibility for commercial contractors. Equipped with BOMAG's patented SIDEVIEW system, the paver's operating console and seat are fully adjustable. The entire operator's platform shifts to the left and right, and the seat can be swivelled to offer up to a 23.6-in (60-cm) overhang, giving the operator an unobstructed sightline to the hopper, side of the paver and screed. All machine functions are controlled directly from the console, and intuitive switch positioning delivers a short learning curve for new paver operators. The BF 300 C-2 boasts patented BOMAG MAGMALIFE technology that heats the screed plates to paving temperatures in approximately 20 minutes. Redefining screed heating, MAGMALIFE heat elements are cast into a single aluminum block that offers superior thermal conductivity. In addition to quick heating, MAGMALIFE delivers more uniform heat distribution through the screed bottom for a tight mat texture without scuffing or tearing. Heated screed end-gates allow for joint matching to increase mat longevity. The BF 300 C-2 delivers the power and traction to pave up to 10-in (25.4-cm) thick mats. Proprietary BOMAG Load Control System (LCS) enables the operator to securely lock the screed into position for a set duration after paver restart to eliminate bumps in the mat. Offering increased corrosion protection, the aluminum heating plates on the BOMAG screed feature a two-year warranty. Thanks to a large 10-ton (9.0-tonne) hopper capacity, the new BOMAG BF 300 C-2 track paver provide extended paving intervals between asphalt deliveries to the jobsite. 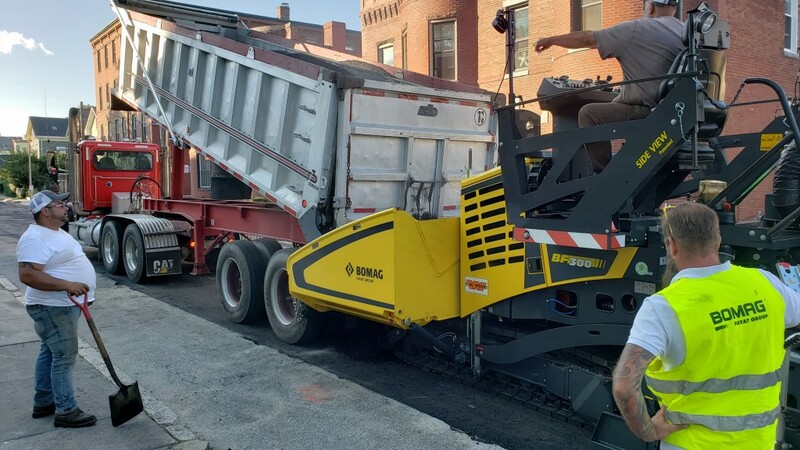 Unique to the commercial class, this paver features a hydraulically folding front hopper gate in addition to individually controlled hopper wings to clear asphalt from the hopper. Left and right independently controlled slat conveyor assemblies channel material to the spread augers, and the reversible slat bars are made with high wear-resistant material for long service life. Powered by a fuel-efficient 74 hp (55 kW) diesel engine, the new BF 300 C-2 paver requires no diesel particulate filter (DPF) or diesel exhaust fluid (DEF) aftertreatment to meet stringent Tier 4 Final emissions regulations. Standard BOMAG ECOMODE active engine and hydraulics management system substantially reduces fuel consumption by up to 20 percent. By delivering fast screed heat-ups, MAGMALIFE further lowers fuel consumption to reduce the paver's total cost of ownership. Demand-driven hydraulics deliver the exact power required for machine functions, allowing engine noise levels to be reduced to conversational levels. Power for screed heating is provided by a 24-kW, 240-V generator, belt-driven directly off the engine. Positioning the generator under the sound-insulated hood and away from the screed operator further lowers sound levels to boost operating comfort. While big on performance, the BF 300 C-2 is compact, offering transport dimensions of 16.6-ft (5.1-m) length, 9.2-ft (2.8-m) height and 6.2-ft (1.9-m) width. Even with 13.8-in (35-cm) extensions mounted to the screed, this commercial paver can be easily moved to and from the jobsite on a flatbed trailer without permits, improving transport efficiency and lowering costs. The simplified aftertreatment system reduces engine complexity to shorten maintenance time. Engine side panels swing open to offer unhindered access to engine, hydraulic systems and filters. The available fully automatic central lubrication system improves machine reliability and helps to extend maintenance intervals. Shock-absorbing push rollers ensure smooth truck pick-up without paver damage and alleviate deviations in the line. The console's toggle switches individually control each machine function and can be quickly replaced, keeping maintenance costs and time to a minimum. Improving machine visibility and safety during nighttime paving operations, the BF 300 C-2 paver can be equipped with 8 LED working lights. For fast clean-up at the end of a shift, the paver has a separate solvent reservoir and system.